The climate-smart agriculture (CSA) concept reflects an ambition to improve the integration of agricultural development and climate responsiveness. It aims to achieve food security and broader development goals under a changing climate and increasing food demand. CSA initiatives sustainably increase productivity, enhance resilience, and reduce/remove greenhouse gases (GHGs); and require planning to address trade-offs and synergies between these three pillars: productivity, adaptation, and mitigation . The priorities of different countries and stakeholders are reflected to achieve more efficient, effective, and equitable food systems that address challenges in environmental, social, and economic dimensions across productive landscapes. While the concept is new, and still evolving, many of the practices that make up CSA already exist worldwide and are used by farmers to cope with various production risks . Mainstreaming CSA requires critical stocktaking of ongoing and promising practices for the future, and of institutional and financial enablers for CSA adoption. This country profile provides a snapshot of a developing baseline created to initiate discussion, both within countries and globally, about entry points for investing in CSA at scale. World Bank; CIAT. 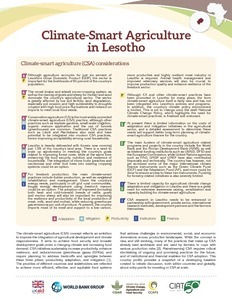 2018.Climate-Smart Agriculture in Lesotho. CSA country profiles for Africa, Asia, and Latin America and the Caribbean series. Washington D.C.: The World Bank Group.